This is SO pretty, Joan!! Gorgeous card! Love your bright flowers with the crisp gray and white sentiment. Joan this is gorgeous! It makes me want to go be on a tropical island! wonderful card, Joan - and love how you did the flowers over the sentiment - but don't get how you removed the ink from the sentiment - i would probably have such a mess - what did you use? Betty, I stamped the sentiment on some copy paper and cut out around the words to use as a mask. Then I stamped the flowers. However, I needed some of the flower ink to get on the white embossing (but not the cardstock). So I trimmed it carefully and then, while the ink was still wet (it won't really dry on the embossed letters) I used a dry paper towel and just dabbed the ink off the words. If you use a wet paper towel it will make a mess!! Hope this helps and thanks for the kind comment!! It is amazing how bright and prominent your white on white sentiment looks. I haven't left white embossing as the star of the show for a long time, I tend to sponge or paint over it. I love the freshness of this card. Heather. the sentiment is white embossed over soft stone (pale gray) cardstock. thanks so much for your kind words! Aha, that is why it pops so beautifully; I am caught out not reading carefully! I do love coming here to see what you make and read what you write even if it appears I do not read what you write! Thanks for leaving me such lovely comments. Wow! This is so striking! 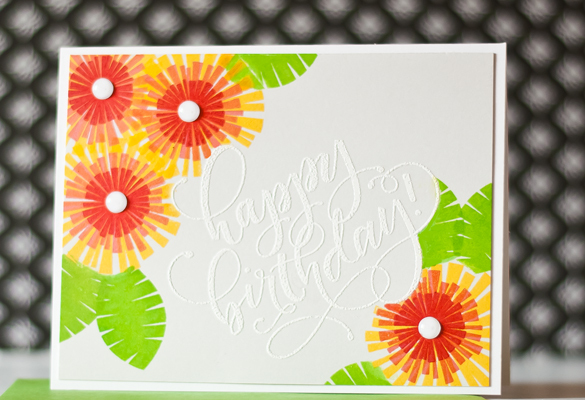 Those flowers are beautiful and the sentiment is great embossed in white on that stone card stock. Great tip about how to make the flowers right up to the words. I'll have to try that! You make the cutest, brightest, happiest cards! Love this! Lovely! The flowers are so vibrant on the white space. Love it! Very fun! Love the flowers right up to the curve of the sentiment! OOOOOOHHHHHHH, I LOVE the white embossing on the soft stone! That is just gorgeous! Your card is so cheery and beautiful, and balanced. I love it. Thank you for the great inspiration! OK can you tell us what brand embossing powder you are using? I have this really old Stampin' Up embossing powder I used recently and it just doesn't look that great when it is heated. It seems to kindof bubble up and doesn't appear even (looks more clumpy). I am thinking perhaps it is just too old. I didn't know embossing powder could get that way but maybe the really old stuff always acted that way and I didn't know any better at the time. Now I expect it to be more even and solid. Hi Julia, this white powder is from Paper Source. It isn't perfectly smooth --but pretty smooth. If yours is old, think it is worth replacing. A lot of folks swear by Hero Arts White. I tend to pick up embossing powder when I am at Paper Source (it is near my house) or at my local Stamp store. I just saw that set at my LSs yesterday and couldn't imagine why I needed it. Now I know. 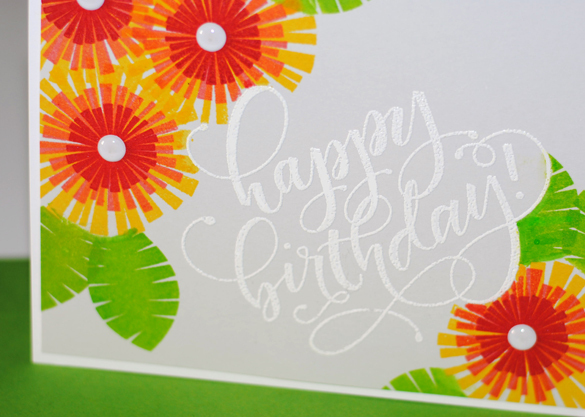 Love this - the bright colors and the white embossed sentiment - lovely! Pinning it.